The Witcher 3's game director believes patches, fixes and additional content should be provided free of charge. CD Projekt Red, the team behind the Witcher series, are no strangers to giving out free content to its customers. 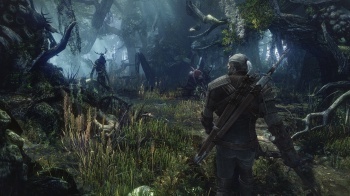 In an interview with the Examiner, The Witcher 3 game director Konrad Tomaszkiewicz shared the company's philosophy on providing extra content for its games. "We could sell extra content to gamers 'down the road,'" he said, "but we don't believe in that." "We believe patches, fixes and additional content should be provided to gamers free of charge. Only something really big, and something that will not make you feel ripped off, justifies a price tag." It should be noted that Tomaszkiewicz doesn't completely rule out the possibility of paid content for The Witcher 3, but stresses that "If we ever decide to charge you for something, we think you will appreciate what you get in return." Considering that The Witcher 2 received over 10 gigs of free content, it would have to be something absolutely massive to justify being charged for it! Tomaszkiewicz's words offer hope in this world of "nickle-and-dime" DLC, where $15 map packs and $10 alternate costume packs run rampant. Both The Witcher and The Witcher 2 received a very extensive amount of free post-launch support, receiving "Enhanced Editions," which added hours of gampeplay and dozens of new quests and animations, released as free updates for existing customers. The Witcher 2 Combat Mod was released (for free) earlier this year, despite The Witcher 2 being released back in 2011. Needless to say, you can probably stop holding your breath for pay-to-win microtransactions in The Witcher 3.